September 2011 – Random Musings Of A Mad Mama! Of all the strange things the internet has opened my eyes to, this one surely takes the cake…. Is life SO busy that you NEED a ‘drive-thru’ funeral home??? Can you really not get out of your car to say Good-bye to a loved one??? Is a sad world that we live in these days… People don’t talk to each other anymore they text, and NOW you can’t even have a proper funeral where people spend time together reflecting on your life!! Tell me WHY is the world going mad??? Below is the article about the Drive-Thru Funeral home that disgusts me SO much…. via Drive-Thru Funeral Home Lets You Pay Your Respects on the Go | AutoGuide.com News. This photo (blurry as it is) was taken through my living-room window at approximately 7:30 a.m. (I was trying to be inconspicuous, hence the blurry image created because using a flash would have been a little too obvious!) But this picture could have been taken at any time throughout the day and it would have held the same image. 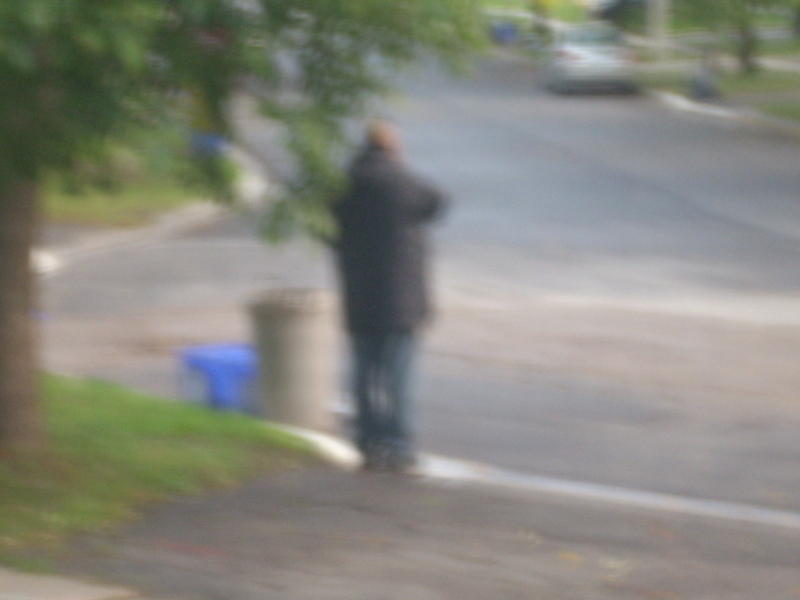 The man in the photo above is the local ‘Internet Bandit‘ Day in and day out he can be found in front of, or near the corner of, my house stealing someone’s unsecured internet connection! Now I am not shunning him because he is using someone else’s connection (we’ve all done it!) but that he is doing it so openly and without any shame in a public area. Not only is he doing this so openly, he is doing it all day long! The funniest part of this whole situation is that you KNOW this guy is probably sitting on Facebook (or some dating site) just lying through his teeth! I can picture his Facebook status as I watch him through my window…. Honestly, my major issue with what he is doing is the fact that he is just sitting on a residential street doing it. He is not going to Tim Hortons or McDonalds where they offer FREE WIFI, he is not even sitting in his own house jumping on his elderly neighbors unsecured wireless network. No, this guy does not even LIVE here, he ‘commutes‘ to this corner from down the block to sit outside and steal internet!! Can you honestly not afford the $19.99?? I bet you could if you went and found a job instead of sitting outside someone’s house stealing their internet all day while you lie to your friends on Facebook!! In fact, if you had a job to afford the internet you probably wouldn’t have the time to be on it ALL DAY LONG! I came across this cute little piece in a local newsletter called “The Perkolator” and I had to share it here as it shows the valuable lessons we can all appreciate learning from our mothers. Thanks Mom, these lessons will last a lifetime!